Art defines the way one can live their life. Our all the gadgets like phones, cars and other are manufactured with an artistic touch. It is a great job to sell your art as it becomes a good source of income as soon as you gain popularity. There are lots of ways using which one can Sell Artwork online and earn money from home. In fact, individually does not need to spend money for purchasing a building to start their store. If you take a look on Internet, then you find many e-commerce websites which will help you in spreading out your work. Hence, by using these websites you can reach a wider market for promoting your work. Actually, some of the sites also encourage the artist to write a description for the artwork they are going to upload. 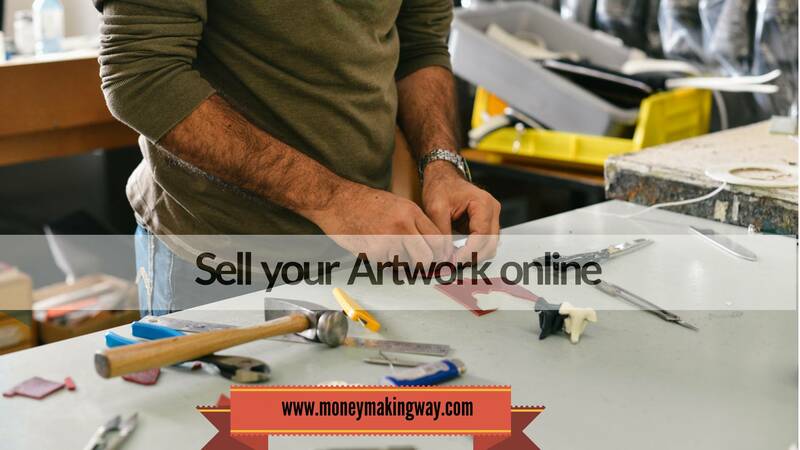 Selling your art online is one of the best ways of earning money from home. Are you looking for best websites to Sell Artwork easily? If yes! Then you are on right place. In this article, one can find some of the best e-commerce sites for marketing their artwork. These online platforms are very helpful as they take your work to the next level or expanding your business. Check out the list of websites where you can sell your artwork. This is the most popular place for the artist to go with if they are thinking about selling their art. This is a great platform for taking your work to a new height. You should have to pay 20 cents per items which you upload. And after selling out of the item there is need to pay additional 3.5% commission. Amazon is one of the largest platforms for selling handcrafts to millions of customers all over the world. One can find a new store i.e. handmade on amazon.com where artists can display their unique artwork. You should have to pay 15 percent fee on each sale. The website allows individual to create their own store as well as they can also customize it. This is a great platform to Sell Artwork for anyone. Here, you can find some professional tools that are helpful in conducting market research. The price that you have to pay start from 29.99 dollars a month. Actually, it varies according to the facility and support you desire to use. Zazzle is a fully customizable store where you can showcase your work. Using this online medium for the promotion of your work, you can reach 30 million shoppers across the world. It is easy to open a virtual store for free on this e-commerce. This is mobile art marketplaces which allow art lovers to gain popularity as well as earn money online. ArtAttack also enables individuals to share works in progress and images of their workplace. They just charge 10 percent costs on sales. One can not only distribute their work through this app but also connect and discover community. It is the world’s largest community for art enthusiasts. This e-commerce site attracts up to 65 millions of unique guests every month. One can easily connect globally by sharing their arts. The DeviantArt mobile application allows an individual to Sell Artwork and communicates with the community 24/7. You can sell out painting, pixel art, anime, drawing, and sculpture to digital art etc. This is a free online marketplace for the art lovers to reach a huge amount of audience. You can easily showcase your exclusive work and make money online by using this great platform. The platform allows you to create an account, upload work and send monthly payment through PayPal. One should have to complete the short application process for joining this moderate art gallery. There is a need to upload your two to three artwork pieces for review. As your work get approval, a new member account will upgrade to your account. In this account, you can upload your artwork sale directly through the site. This is another online e-commerce website which allows individual to sell their artwork as a product. You just need to set up an account and add some artwork. It is a great platform where you can Sell Artwork because the site will take a small percentage of your selling. Society6 website runs free shipping promotions worldwide. eBay contains an art section which makes it possible for the artists to display their talent One of the advantages of working with this site is that individual can get all the money they have earned from the sales. This is a great place to kick off as an artist and for making a profit too. It is one of the art community websites in the world where one can sell print on demand copies of their work. This website endows lots of tools for individuals for connecting with the collectors who want to buy art originals. In fact, you get monthly plans which range from the free plan to 18.00 dollar per month according to individuals need. In this platform, artists have to submit their work and then rise art authority gives ranking to their art. If the ranking goes higher, then the work of individual gets a promotion. This is a good site for the beginners as there is no membership or setting up account charges. UGallery is the best option for an individual if their want extensive marketing and promotion of their work. Actually, one needs to pay 5 dollars for applying to Sell Artwork on this website. This allows you to sell paintings, sculpture and mixed media online. This artwork marketing and promoting a website is free to use and set up. Speedy sells art directly on social media sites like Facebook or Instagram. In fact, it does this by turning social network page into a tool for selling individuals work. The site only charges 3 percent transaction fee from its users. Ths design of this online artwork selling website is crisp and easy to navigate. One can easily set up an account and upload their work free of cost. In fact, they have to pay 45 percent commission on each art sale. There is no premium membership option in this website like its competitors. This platform work by bringing art buyer and seller together online. Here, the buyer begins a project and then sellers try to Sell Artwork or promote their work. In fact, this site charges 40 percent commission on each sale. This is one of the e-commerce websites that also allows artists to sell their product. Artist shops site handle all the activities regarding the artist’s product like manufacturing, shipping, and customer handling. If you want to earn more profit then this site is best for the promotion and marketing of your work. It is an online platform which allows artists to sell their work all around the world. This site allows artists to set their own prices for their work. And they have to pay 30 percent commission on their each sale. One can create a free gallery or there is no membership fee to set up an account on this site. This site directly transfers the payment to the artist’s If you take a look on the site, then came to know that 81000 artists have already Sell Artwork with this online platform. This website helps artists in selling their work by matching them with the buyers who want some custom artwork for them. Actually, the buyers send their request on the site and then artist let them know the bids. CustomMade charges ten percent commission on any sale of art. Direct2Artists site endows a way for the art lovers to promote their work in an effective way. In fact, it is all on one platform as it handles sales, marketing as well as the business side of the art. Here, the membership plan ranges from free to 49 dollars per month. You can set up an account free of cost and without any hassle on this website. Actually, this platform will provide a store to an individual for selling arts or crafts online. The site will charge 2.9 percent commission on each art sale. It is a print on demand site which ensures free art profile page for you. You can take your work to the new height by using this Sell Artwork Here, one also gets promotional and marketing help for their artwork. This online platform sells original art of the artists. You do not have to pay any membership fee or account set up fee. Actually, Saatchi art website will charge 30 percent expenses on each sale of the item. This website works in a different way as it puts buyers and artists Actually, the buyer clicks the picture of their wall space and then art lover provides the recommendation. After this, the buyer will see the art propose by the artist. Vango takes 30 percent costs on each sale of the art. The sketching shop does not charge any membership fee for opening a store on the site. In fact, this platform allows the artist to sell out their original sketches only. And the site will indict 30 percent commission fee per every Sell Artwork. Artists get a free online store to display their artwork in front of huge audience. They just have to pay 15 percent commission of the purchase price of each art sale. This online platform gives individuals opportunity of submitting their work for selling globally for the community votes. If you get more votes, then you can make money by selling your art online. Art web e-commerce site sells your art online to the buyers across the worlds. Lots of creative’s and art lovers are using this platform to promote their work. This online platform offers their services on no fee basis. This print on demand website allows the artists to sell their wall arts. One can set up their account free of cost and all the tasks including shipping and customer’s service is the responsibility of the website. Artists to pay 6.2 percent transaction fee on each sale. Artists can open the store for free and then they are offered with premium membership plan of $30.00 per year. This is also a print on demand website which is affiliated with Fine Art America. One can get lots of option for the promotion and more sale of their artwork. Here, one can Sell Artwork online and they have to ship art to the buyers. Art Finder takes care of all the payments. One should have to pay 30 percent commission and 3% credit card processing fee too. It is a free platform for the artists means they can sell arts commission free. One can promote their artwork on this e-commerce website and get a chance to join artist’s community. The site will display the work of artists in different venues such as hotels as well as restaurants. Daylighted charges 30 percent commission on each sale of the arts. This amount is further split into two parts i.e. 15% to the e-commerce site and another half for the venue. The artists can set up an online store to sell their work on this platform. The membership fee that one should have to pay ranges from free to 12 dollars. This site endows a quick and easy way for the artists to Sell Artwork There is free membership and one can also upgrade up to 25.00 dollars per month. They also provide help for individuals through phone or email. Mojarto is a great place for an artist to sell their arts and make good money. We can sell photographs, digital art, drawing, printmaking, painting, serigraph, 3d sculpture, and textile. List your items on the website and you will get your payment within 7 days once purchased by any buyer. It is a great platform for the artists to distribute and sell their work. The site only charges 20 percent commission on a single art sale. In fact, the membership is also free for everyone. The prophetic gallery specializes in selling art of individual in a Christian theme. The artists do not have to pay any fee for setting up an account and can start Sell Artwork. They just have to pay 50 percent commission on each sale. This online platform helps the artist to sell their artwork on Instagram. One can get a link to their page on the gallery having the Instagram look and feel too. This website will offer lots of tools for the individuals they need to kick off their artwork selling. This is a great online platform for artists to display their talent along with earning fame in the art world. Ezebee is a free website for the handmade manufacturers and others all over the world. This allows individuals to create their own showroom as well as start selling their arts and crafts online. This is one of the most popular and famous social networks and it can also become online art store. This site has integrated e-commerce which allows you to Sell Artwork and promotes your arts online. The e-commerce website is based on a hotel theme in which each artist has given room to display their work. In the beginning, the HouseofSass offers six month free plans. After completing this time period different plans are available there ranges from 7.95 dollars to 15.95 dollars. It is a great platform where the artist can sell their artwork online. LaunchMyWear offers a free storefront, secure e-commerce, and drop shipping. This site will automatically collect some fee per product when an individual makes a sale. This website print art images on canvas and one can also find a section there for directly selling the art to the public. Artist can upload their art images free of cost. The website will add the printing costs to the final Sell Artwork price of your work. The platform is to sell paintings online and they charge 20% commission on sales. Create account make listing and once the delivery of time is confirmed they will make the payment within 10 days. The have some additional features which gives you more visibility on their platform like price vlaue of paintings, number of uploaded paintings, profile views, and social shares. The web site rent artwork for the residential and commercial clients. You have to submit your artwork on the website and then the jury will decide whether your art considers or not. It is a popular website where one can create a collection by pinning images around the web. One should have to list the price when they pin their work. This is why because a click on the image will take the buyer to your own website. And in this way, an artist can make the sale of their work and get popularity. This site is a reliable platform for individuals to sell their art collection. My art broker provides an opportunity for artists to build a strong network and showcase their talent. I bet you do crossword puzzles in ink. When I read your write up I could feel myself getting smarter. Spot on with this website. Your websites are shocking. You are a very persuasive writer. I just found your write ups on Tuesday. Your perspective is beyond refreshing.